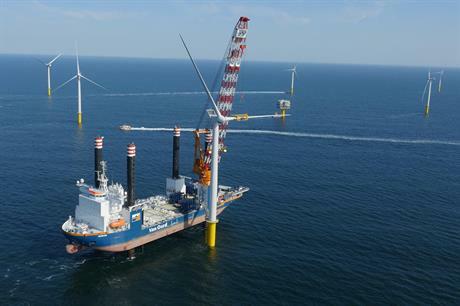 BELGIUM: Transmission operator Elia will build the planned modular offshore grid (MOG) to deliver offshore wind power to the onshore grid from four projects. The MOG comprises an offshore platform about 40km off the coast, to which four planned projects – Rentel, Northwester 2, Mermaid and Seastar – will connect. Three 220kV submarine cables will link this "plug" to the Stevin onshore substation near Zeebrugge. The MOG will initially be built for 1.05GW capacity, but this can be increased in future. "With this decision, new wind farms will be able to connect to the Belgian grid in a cost-effective and reliable way," Elia said. It will also have less environmental impact, saving an estimated 40km of cable compared to connecting each plant individually, and will allow further development in future. "The modular grid is a first building block of a future North Sea Grid," CEO Chris Peeters said. Elia is carrying out the detailed design of the offshore platform, and the tenders for the main construction contracts are under way. Completion is scheduled for autumn 2019. The 309MW Rentel project, which is due online by the end of 2018, will build its own connection. Elia will then buy the export cable and those parts of the offshore substation needed for the high-voltage connection. The total investment is estimated at €400 million. Once completed, Elia will own and operate the offshore assets.